The Bugatti Chiron is all about power. That is the reason why the hypercar does not come cheap. With a $3 million price tag, the vehicle packs a mean engine. Recently, it was spotted while being tested in Nurburgring. The Chiron is already being delivered to customers. So it is quite unusual to see it doing rounds in the endurance track. Normally, vehicles being driven in Nurburgring are those that are yet to be sold. Does this mean that we will see updates in the auto? The Chiron carries an 8.0-liter W16 engine with quad turbocharger. The unit produces a mind-blowing 1,500 hp and 1,180 lb-ft of torque. The output is distributed by a 7-speed dual-clutch transmission with manual mode. The configuration allows the vehicle to run from zero to 60 mph in just 2.3 seconds and achieve a top speed of 261 mph. The passenger of the Chiron in the video appears to be holding a laptop. That is strange since we already have the official figures of the hypercar’s performance. 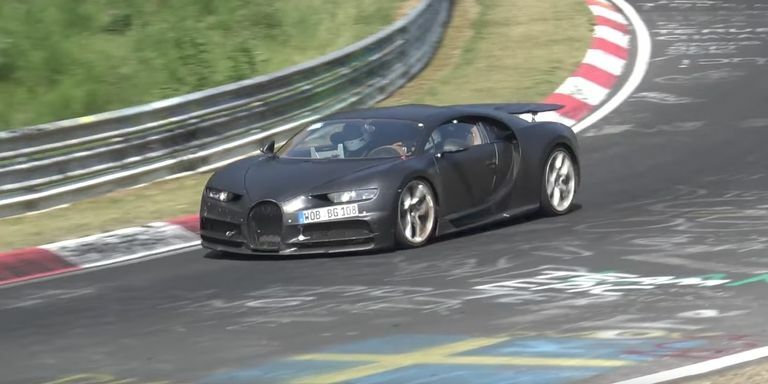 It is possible that Bugatti might be developing a special edition of the Chiron. It should be noted that the Veyron had taken that direction numerous times in the past. One of the special edition models produced under the range was the 268 mph Super Sport model that got the distinction of being the fastest production car in the world. If that is true, the updates in the auto will likely be in the power only as everything in the spied hypercar’s exterior looks the same as the existing model of the Chiron. According to Road and Track, they already tried reaching Bugatti for comments about the car in the video. The company is yet to respond to their inquiry.